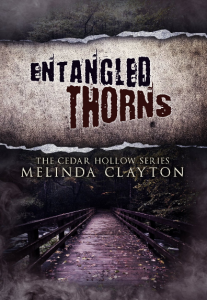 By accident I started reading Melinda Clayton’s Cedar Hollow series out of order, but it didn’t reduce the experience for me in the slightest. After the well-defined characters, what I like most about this series is how the sense of place becomes a character as well. It feels especially powerful in Entangled Thorns. I can almost smell Rugged Creek and feel the shock of the cold water and hear the whine of the mosquitoes. The vegetation, the land, the very humidity in the air…I can practically taste it. And yet it doesn’t become overwhelming or feel like too much detail. I know when I start highlighting passages on my Kindle about the quality of the sunsets or the texture of the night skies, it’s something I’ll be hard pressed to put down. This book is an intense, skillfully meted out narrative about two sisters who escaped Cedar Hollow in their teens and then lost touch. Now, with their mother in poor shape, they are summoned home, and must decide whether to return and face the horrors they’d fled. And the different women they’ve become. Of course, it wouldn’t be much of a story if the sisters didn’t return. Chapter by chapter, the characters reveal their lives, their thoughts, and pulled me in deeper and deeper. Right to that place where I needed to keep reading to find out what happens next. I really liked the care Ms. Clayton used in making the characters unique and compelling. Even the minor characters, like Beth’s husband, Mark, were fleshed out in a way that held a mirror up to the protagonists, showing bits previously hidden. I hope so, too. 🙂 Just recently finished Appalachian Justice — great book! Hope it’ll be a Rursday soon, Lynne! Thank you, Laurie. 🙂 I’m so glad you enjoyed it, and I appreciate the wonderful review! Ms. Clayton is a wonderfully skilled writer. I have loved every book of hers that I have read so far. Her character development is only one of her strong suits. I have no doubt you will love the rest of the Cedar Hollow Series. Totally agree, Linda. I’m so psyched to read more.